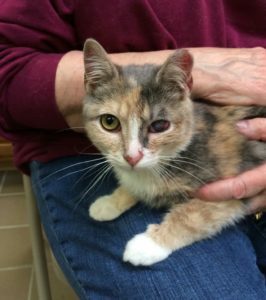 WALNUT is a “peanut” of a dilute calico- rescued in Lindenhurst April 2016 at about 5 months old.- spayed, vaccinated and ready to make her debut appearance in a loving home. Bet you never adopted a cat debutante before. Yet, one more reason to visit WALNUT at Last Hope . Her charms may reel you in. This entry was posted in Adopted, Adopted Cats, News. Bookmark the permalink.